When it comes to torches of strong Black women civil rights legacies, there are a lot to carry. 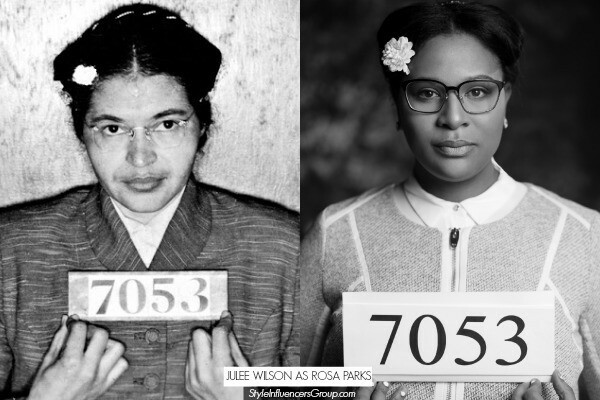 Fortunately for us there are plenty of contemporary black women up for the task, and the #WeAreBlackHistory photo series was devised as the perfect way to honor them. The project, launched on Elle.com, is a creation of three women co-founders of Style Influencers Group -- a network dedicated to connecting brands with prominent black influencers of the fashion and beauty worlds. Jessica Andrews, Christina Brown and Lexi Felder took inspiration from the #BlackLivesMatter movement to limelight current cultural figures that demand the same ideals of equality as the civil rights legends before them. Each subject has a personal kinship to the idol they portray -- something that photographer Jerome A. Shaw flawlessly communicates with focused light in black and white. Christina Brown explains the pairings of the series: “They were chosen not only because they are deeply inspired by their icons, but because they're making a tangible impact and shaping our history with their words, actions, and images." The classic retro-styled hair, makeup and nails were crafted by Seto McCoy, Kayden Makeup Artistry and Gracie J, respectively. And beautiful shoulders they are. See the rest of the #WeAreBlackHistory photo series here. Please share our information with others. Watch our informative television programs on your public access channels: Frontier (formerly AT&T), Channel 99, drop down; Charter Communications Chan. 21, and Comcast (Optimum) Channels 10, 15, 18 & 26.